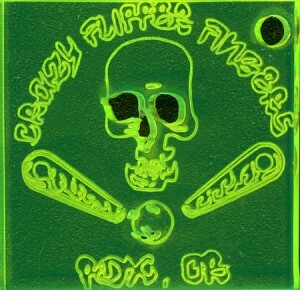 Hey gang, and stars, and everyone in between – I thought I’d share an image of this super rad glow-in-the-dark-in-my-brain CFF keychain! It was made by pinball maven extraordinaires, Jeri Ellsworth and Trish of Ricochet Pinball. They presented them to us at the most recent Voodoo Too Classic Cup… so if you’re a member and you weren’t there, then your only chance of getting one is to be the first one to don a comfy sweater and then tell me how right I am about… I dunno, maybe about how colorful and crazy images of elaborate combo shots are enhancing the substance of this website like 2x-3x. Or, better yet! Design your own combo image and submit it. Because I have an extra keychain, and I’m willing to give it away! A few lucky people got their CFF keychains in mirror color (like, it’s a mirror). So, if you’re like Danny Backglass, you can whip out the mirrored keychain while waiting for modes to start so that you can quickly check up on your carefully cropped bangs. Thanks Ricochet! You guys are not only circuit board whizzes, and also not only righteous operators, but also good people. Sorry about complaining about machines when I lose. And sorry that I failed to restrain Danny when he kicked Road Show multiple times in front of you after I beat him in that tournament. I’m supposed to be his mentor in all things chill. We haven’t been here a 4th time in ’09, so here we are again! Well I got sick of seeing something about Seattle on the front of our page. So I took initiative to do something about it. Like Sir Snuggles of Tower Multiball has done here with Dexter Evil Genius looking on. 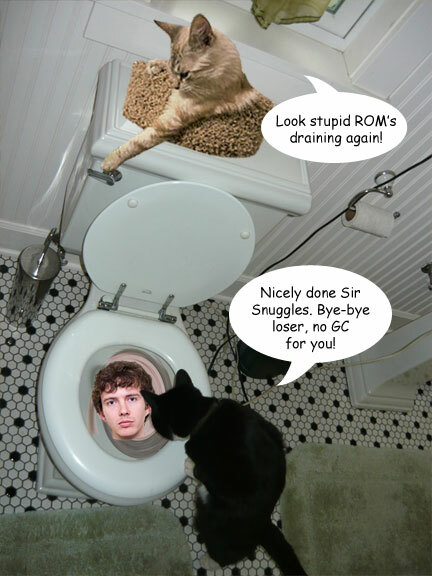 You know many times in your life you have wished you could flush Rom down the toilet and take his quarters from him. Sorry if this reminds you of middle school Rom. On another note about Rom, he recently won the last Standard tournament, nicely done. Well I don’t have much to say, just trying to fill some space here. We will be having a split-flipper tournament coming up soon, so start thinking of who you want your partner to be. Ground Kontrol is in the works, the date is going to be April 18th. Also, I have heard word there may be an event thrown in the S.F. area in mid-late Feb. I’m not sure if it is going to be a bigger event or not but we should go down there and win it. Have a good day! CFF Meeting @ Ground Kontrol @ 10pm with happy hour drink specials extended all night (for gangsters). Feel free to be there early.